Earlier getting a new phone used to be exciting but the thought of transferring contacts, photos, videos etc stored on the device and not your SD card was enough to dampen your excitement, but after reading this post you will feel transferring data was never easier after buying a HTC Smartphone. The transfer is done wirelessly without the problem of connecting your devices like we see in Xperia to iPhone transfer, here HTC has made sure that all the data is transferred over WiFi as both the devices are connected wirelessly. In the New HTC device go to Settings > Transfer Content > Click on the required option like “HTC android phone, Other Android phone, iPhone or Other. Select any one of the above depending on the type of OLD phone which you have. Now on the old phone select all the data which you want to transfer to your new phone from the list of Options seen here like Bookmarks, Calendar, Messages, Contacts, Music, Photos/Videos. Settings. After selecting press Start button you have to just wait as the data will be transferred in a really short time depending on the amount of data you are transferring. With HTC transfer tool you do not need any wires or cables to help connect the devices as all the data transfer will be done over WiFi Direct and the speed of the transfer depends on the Wifi connection available. 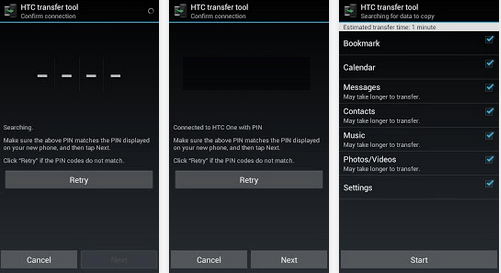 You can even transfer data faster than you could through your Bluetooth like Videos, Photos using this App, Brightness, Alerts and other settings are also transferred through this app from your old device to new HTC Smartphone using the HTC transfer Tool.